Folks attending RootsTech asked if there was a way to have a meetup. Given that I’m entirely new to this conference and venue, I wasn’t exactly sure how to make that happen. Fortunately, Family Tree DNA has very graciously offered to host a meetup at their booth on Wednesday, February 28th, from 6:30 to 7:30 PM. The RootsTech opening keynote happens at 4:30, followed by the Innovation Showcase. I’ll want to see those, and you will too! Fortunately, the keynote, along with some other sessions is livestreamed, so you can join in person or at home. At 6 PM, the exhibit hall opens. After the opening session and Innovation Showcase, I’ll go directly to the Family Tree DNA booth, #1427, noted with the red arrow below, near the Cyber Café and Coaches Corner. Please stop by and say hello! I’ll be wearing my purple chromosome browser DNA dress and will tell you the story about how it evolved, no pun intended. The map below shows the entire conference area. The Family Tree DNA booth is designated by the red arrow, although the name isn’t shown on the booth on this map. By the way, you can download and print a (much better) copy of the exhibit hall map at the link below that includes the names of the larger vendors. You’ll want to mark your printed copy with the location of the FTDNA booth. This map is slightly different than the official RootsTech map which only shows booth numbers. Being able to orient yourself visually by the vendors’ booths is really helpful, at least for me. 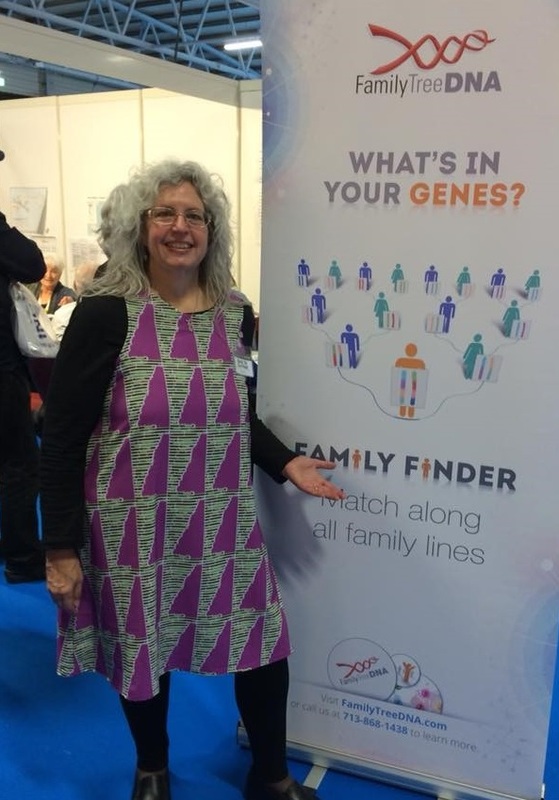 See you at the RootsTech meetup – Wednesday evening, 6:30-7:30 – Family Tree DNA booth 1427. Let me know if you’ll be at RootsTech. I can hardly wait – T-minus 3 days now! This entry was posted in Conference and tagged Historical or Obsolete by Roberta Estes. Bookmark the permalink. For those of us unable to attend, I hope you’ll post a photo of you in that DRESS. Also, I’ve been meaning to ask if you share your kit numbers (GEDmatch, etc.). I truly believe we would ALL like to find that we are related to you!!! It’s in Salt Lake City. If you click on the livestreaming link, in the article, it tells you the livestream schedule. Also, those are available after the conference on the Rootstech website. So if you can’t watch at the time, you can generally catch them later. I’ll see you at Roots Tech Roberta, on the RootsTech App you can add friends. Its a pretty cool app. My 3rd year and love this conference. I am so glad you were able to schedule a meetup Roberta, and yes!! I’ll be there for sure!